Alright... It is much delayed, but here is the un-veiling of my recent breewery activities.. Enjoy. Sparging is something I take very seriously. Take this brewery for example. Basically when brewing beer it is important to rinse the grain bed of any remaining sugars and keep its buoyancy to avoid compression.. not too complicated.. just add some hot water every once in a while as needed. 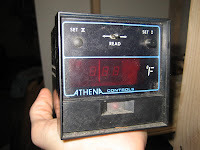 To begin with we have a temperature controller who, with the help of our newest addition the Watlow Solid State Contactor Relay, will be able to switch the heater element inside the sparge tun on and off in a manner determined by a proportional–integral–derivative controller (PID controller), which actually learns while monitoring the temperature and eventually anticipates temperature drops before they happen effectively eliminating any temperature fluctuation. 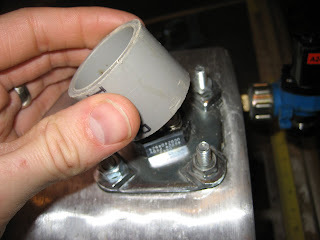 The heated sparge water is then dispensed by the opening and closing of a solenoid valve, which is actuated by a float switch in the mash tun that engages if the water level drops below the desired level. 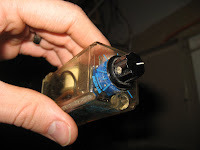 There is a slight problem that I foresee with this scenario however, and that is that I think that the water would change level very slowly and therefore would be constantly hovering right at the point where the float switch may begin to switch on and off rapidly with every slight change. For this reason I have included a delay relay in the circuit. 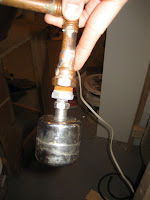 This will cause the solenoid valve to open only after a delay of 1-15 sec after the water drops below the float switch. 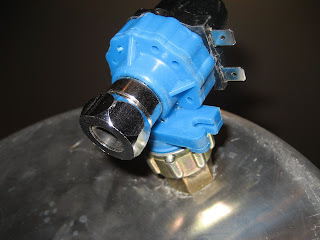 This should give just a little gap between where the valve opens and where it closes so that the water will move up and down a bit more but the the valve will not be fluttering on and off. My sparge tank has a 3500W element mounted in it which means I have to mix electricity and water which is kind of like mixing liquor and driving on the railroad tracks. 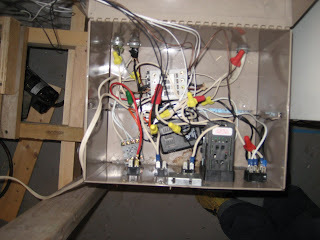 I've been trying to come up with some way to protect the wire terminals from accidental spills or other undesirable contact with the live wire leads connecting to the heater element. I figure I will probably never have to remove the leads from the element as long as I put a plug at the end so that I can essentially just have a cord hanging from the kettle that I plug in. 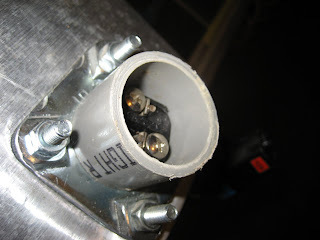 So I cut a piece of pipe and placed it around the terminals... I figure I'll just mount the cord onto the terminals and then gob it up with silicone to hold the pipe in place and cover the terminals with a non-conductive material. 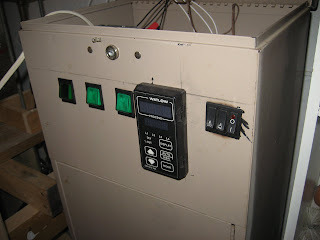 All this business needs a wiring system capable of controlling it all. I bring you the newly improved control panel. 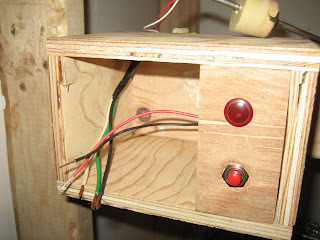 Notice the addition of the three rocker switches on the right. These will control the sparge functions of the brewery. Wait, it's not good to drink and drive on railroad tracks? you are boring and i hate kissing you.